Barra de Navidad, on the Costa Alegre, midway between Acapulco and Puerto Vallarta, is a picturesque, friendly little fishing town built on a sandbar that extends into the Bahia de Navidad. The town is a 20 minute drive to the Manzanillo International airport with direct flights in season from Calgary,, Houston, Phoenix, Los Angeles and, of course Mexico city. Barra, as it is familiarly known, is a charming, safe town which is sleepy in the off season and bustling at Christmas and Easter Week. For swimming and water sports, you can choose between the calm waters of the lagoon, the beach on the bay or one of the spectacular neighbouring beaches. At the far end of the Bahia de Navidad is the busy town Melaque. For those looking to explore and visit , Barra is 2 hours from Colima, 3 hours from Puerto Vallarta and an easy 4 hours to beautiful Guadalajara. Many of the cobblestone streets are open to pedestrians only and the village is easily explored on foot. Across the bay, accessible by road or water-taxi, in Isla de Navidad, is the 5 star Grand Hotel, with marina and a world class golf course. Barra abounds in good restaurants, great sport fishing, excursions and all variety of water sports.We have breathtaking sunsets,a tremendous variety of birds and we are blessed with warm, delightful people. Time for REAL REST. Our casa is a spacious, comfortable two-storey family home. 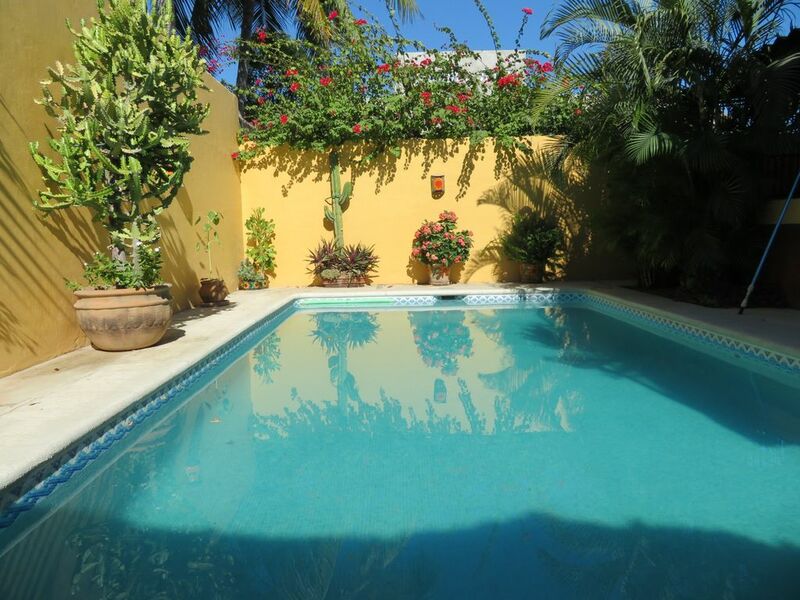 The property which is on a large double lot, is fully enclosed for complete privacy and security. We have wonderful staff who come twice weekly and the property is impeccably maintained. Within the 8-to 10 foot walls which surround the property you will discover the large palapa, two separate outdoor eating and bbq areas, luscious, mature tropical garden, a fountain and a good sized pool. Indoors, the living/dining space on the ground floor is completely open and we have recently added a pool table! You will also find a fully equipped kitchen as well as a full bathroom downstairs.Ceiling fans throughout. Upstairs; there is the den/ TV /office area, plus 2 full bathrooms and 3 large bedrooms (king, double and 2 twin; all with fans and AC in the master bedroom) with large front and back balconies. The house is fully equipped, plenty of towels and linen, lots of books, games CD's and DVDs for relaxed and easy living. A WIFI connection has recently been installed and is available to visitors. We have good neighbourhood grocery shopping and some of the best taco spots in Barra a minute away. We have recently completed construction of lovely guest house on an adjoining lot,next to the main building. It is also fully enclosed and secure. The new casita has a king bedroom with adjoining full bath. It has a small but fully equipped kitchen as well as an indoor living area and an outdoor palapa dining area. The guesthouse is completely independant of the main house, however the two properties can be opened up to share the garden and pool.The two houses can be rented together for larger groups (max 10). NB. THE RENTAL RATES QUOTED BELOW APPLY TO THE MAIN HOUSE ONLY. COST OF THE GUEST HOUSE, IF NEEDED, IS AVAILABLE ON REQUEST. Housekeeper, gardener and pool maintenance come twice weekly. On our very first visit to Barra we were completely smitten. The location, the sun, the sea, the relative social stability, the delightful people, the enchanting village, the energy and the hospitality were overwhelming. Within three days we bought our wonderful casa and we have not regretted that impulsive decision for a moment since. One of the marvellous aspects of spending time in Barra is the many alternatives which are possible. You can stay put.... totally... hang out around the pool, shop in the barrio, eat at home, play pool, listen to music or you can explore the village and immediate surroundings; Melaque, La Manzanilla,La Colimilla, lunch at the Grand Bay, golf, fishing or water sports. For those curious folks who can stay longer, we are two hours from the wonderful, colonial town of Colima, four hours from Ajijic and Guadalajara, the artisanat center of Mexico, and La Ticla, some of the best surfing on the coast. Bustling Puerto Vallarta is only three hours north along the coast with marvellous beaches and exclusive hotels along the way. We really enjoyed la Casa and Barra. The house has everything you need for cooking, pool, beach, etc. There are many spaces in and around the house to chill so even with a full house you never feel crowded. The location is also very convenient as you can walk everywhere and all the essentials are literally right out the back gate. This is our third stay at Alison’s beautiful home, and we hope to go back next year. The house has everything we need to be comfortable, and the pool was great for cooling off in the afternoon. It was nice to see Chayo and Ruby again. They are so friendly and conscientious about keeping the home clean. I also want to thank Alison for quickly answering my many questions. Our family of ten rented the house and casita. Plenty of space, comfort and activities for all. A nice walk from the house into the center of town. We loved it. Very comfortable and well stocked home. Nice outdoor living space to relax and unwind. Would definitely recommend this home. Perfect house and property for our family getaway. We had an amazing stay in Barra at Alison’s place. There was plenty of space for all 7 of us. Sun when we wanted it, shade where we needed it. Chayo and Ramon (maid and gardener) we’re both sweet, thorough and helpful. The house was very well equipped from multiple coffee makers, plenty of dishes and pots and pans to boogie boards and a beach umbrella. We loved being able to walk across the street for a jug of fresh OJ in the morning or down the block for tacos for dinner. We would happily stay here again. We spent one week at Casa Tranquilidad and found the accommodation to be very comfortable, clean, tidy and well equipped. It is very roomy and even with 5 adults and 2 children there was plenty of space. The home is nicely decorated with Mexican decor and many interesting pieces of art. Steve worked on his pool game and even entered a local tournament after brushing up on his game on the billiard table.The kids enjoyed leading a morning aqua aerobics class to us adults, which we needed to get us warmed up as the pool remained quite cool all day. It would have been nice to have the pool a few degrees warmer but other than that everything was great. We would love to return. Rental on a weekly basis only. Rates quoted are for the large house which accommodates a maximum of 6. To accommodate larger parties, if the guest house is required ,the rental rate is $600 CDN weekly.